The nation’s favourite trash-talking teddy bear returns to our screens this week with the release of Ted 2. For those who haven’t seen the original, Ted tells the story of John Bennett’s teddy bear, Ted, who came to life as the result of a childhood wish. Ted 2 takes off from where the original film left with Ted (Seth MacFarlane) marrying the love of his life Tami-Lynn (Jessica Barth). The newlyweds want to have a baby but as Ted is not legally ‘human’ they are unable to adopt. Que a series of drunken idiocies and witty one-liners as Ted, his buddy John (Mark Wahlberg) and inexperienced young lawyer Samantha (Amanda Seyfried) embark on a legal battle to prove Ted’s is a person in a court of law. Written and directed by Seth MacFarlane, Ted 2 is full of Family Guy style humour, from the opening ‘swing’ title scene to the slap-stick comedy scene at New York’s Comic-Con. Like the first film, the dialogue is raunchy and vulgar with a lot of swearing and crude humour but some of the gags are pretty funny, particularly the scene when Ted and John visit the hospital to get sperm for Ted’s baby. Seth MacFarlane return as the voice of Ted, the foul-mouthed but loveable teddy bear fighting for his civil rights. MacFarlane steals the show with Ted’s off-the-wall humour and outrageous comments. Mark Wahlberg also returns as John, providing the sounding board for a lot of potty-mouthed teddy bear ranting. The locker-room banter between Ted and John is full of infectious mischief and Wahlberg’s comic timing is spot-on. Amanda Seyfried replaces Mila Kunis as Wahlberg’s main squeeze, the young lawyer Samantha. Clever, funny and incredibly likeable, Seyfried’s character is well written but doesn’t quite have the comedy edge of Kunis. The film is packed full of cameo appearances from Morgan Freeman and Liam Neeson to Tom Brady and Jay Leno, all of whom deserve a mention (particularly Tom Brady and Jay Leno) for agreeing to embarrass themselves on the big screens. The film has been given mixed reviews by the critics. Robbie Collin from The Telegraph gave it just one star calling it ‘dated and tedious’ while Stella Papamichael from Digital Spy gave it three stars saying “even if this isn’t solid comedy gold, it’s still much funnier than a lot of other fluff”. 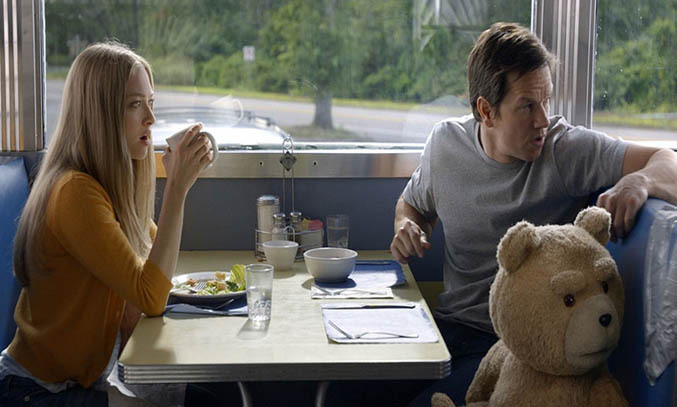 If you can put aside the crude jokes and slap-stick comedy, Ted 2 is essentially a story about love and friendship. All in all, Ted 2 isn’t going to set the world alight but if you loved the first film, there is a very good chance you will enjoy this one. Ted 2 is released in cinemas on Wednesday 8 July.